Justin Bieber is gonna release his new album Under The Mistletoe on November 1st. Now some people don’t have money to buy his new album. This is what the Justin High Quality Team is gonna do. We are going to have a contest until his new album hit’s stores. Who ever win’s gets a copy of his album. To enter the contest you must be following our twitter @JustinHQ. If you are not following us you won’t be entered in the contest. Once you followed us please email justinhqdotnet@gmail.com the following application. After you filled out the application, you will receive a number that you would need to save somewhere. After the contest is over, we will post the # on this post, and you’ll receive an email from the team. For right now this is for United States residents only, if you would like you country added. Email us at justinhqdotnet@gmail.com. Thanks and have fun, and note that the information sent to use won’t be public only the admin will have it. How often can you update the site ? Do you know how to create albums? Do you know how to upload pics ? Do you know how to create categories? How often can you update the gallery ? How often can you update the gallery/site ? Admiring Emilia Fox is your newest source for british actress Emilia Fox, probably most known from her role as Nikki Alexander in Silent Witness or Morgause in Merlin! We are here to offer you a daily dose of everything Miss Fox, including news, interviews, photos and more. For all the latest updates, do follow us on twitter @admiringemilia, enjoy! William, the webmaster of Nicki-Minaj.Org, is looking for new co-webs who could help him run his Nicki Minaj’s fansite. If you are a fan of Nicki Minaj and have some experience with WordPress/Coppermine Gallery, do not hesitate and apply now by emailing us at flaunt.nu@gmail.com. JustinHQ.net also known as Justin High Quality is looking for elite affiliates with any high quality website. These cannot be .webs, etc. They must be a domain. Please email us justinhqdotnet@gmail.com with the following application. Thanks and have a great day. 5. Note: If you are not accepted do you wanna be tops? Vanessa Carlton Fans is proud to announce the TWO YEAR ANNIVERSARY of our fansite! Two strong years of bring Vanessa Carlton fans together! Because our site is getting bigger, we are looking for staff members who are dedicated and are looking for a friendly site to be apart of. We are in search of co owners, a multimedia member, and a photo member. email us at Admin@V-Carlton.net to apply. WE ARE ALSO HAVING A CONTEST! We are giving away a limited edition Signed Vanessa Carlton poster! The poster is numbered 125 out of 500! Check out the site on how to win this awesome poster! 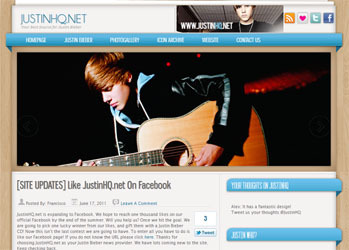 JustinHQ.net is a fansite dedicated to Justin Bieber. We strive to give you the latest news, videos and even more. We started the site back in May and has been getting bigger and bigger everytime it’s getting updated along with SelenaMarieGomez.org which got opened on her birthday. Me (Francisco) will be looking for co-owners who will be able to update at least two times a day. So if your a fan of one them apply. You must know a lot of experience with wordpress please do not apply if you don’t. Second you must know how to resize photos to 500×200 and edit them a little. Third you must know HTML. Forth you have to update two times a day or at least one, but were aiming for two. Below is a form. Please copy it and paste it on the email your gonna send to us than just fill the blanks in and send the message to justinhqdotnet@gmail.com if you wanna help with the Justin Bieber site or selenamariegomezdotorg@gmail.com for the Selena Gomez site.